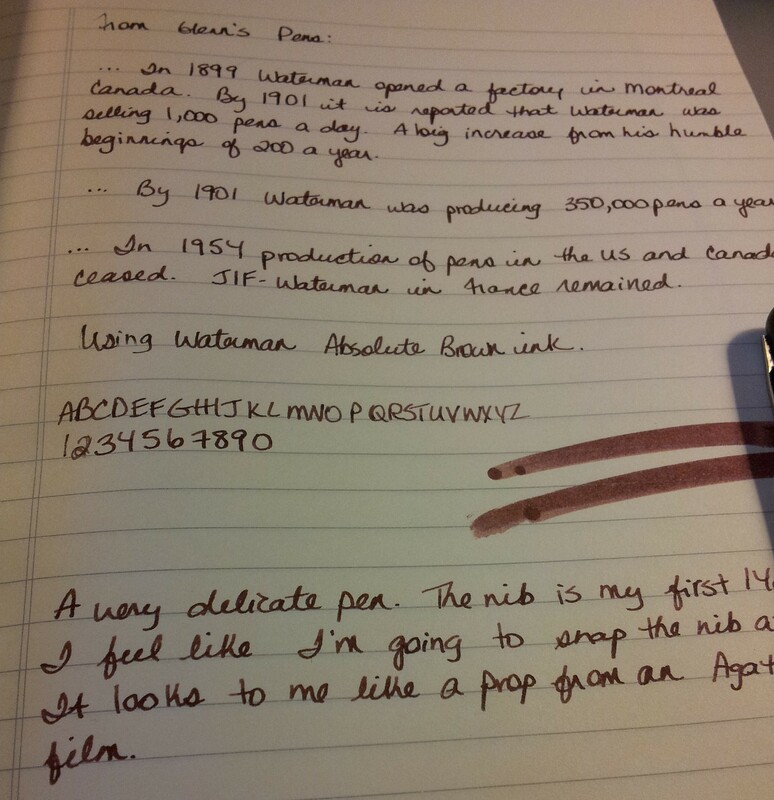 I stumbled across the Goodwriter’s site recently and purchased a Fountain Pen Revolution Guru pen, which is STILL in Customs in Vancouver, as I write this. About a week after I purchased the Guru I received enough points from World Mail Panel to redeem $100. So I purchased a Canadian Waterman Junior, also featured on the Goodwriter’s site, with a 14ct nib, made around 1934. I’ve been wanting a vintage pen for awhile, and I fell in love with this one on sight. So I anxiously watched the mail for the next two weeks. The Royal Mail tracking system told me my packages were in Vancouver. 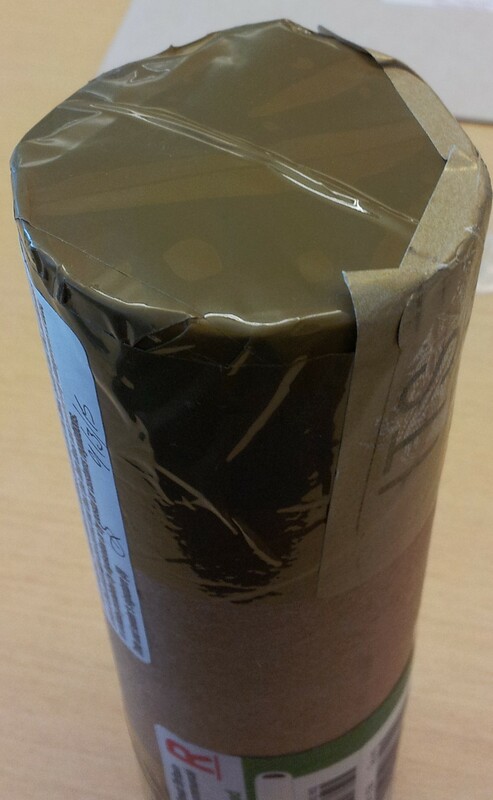 Then this past Wednesday I received notice that I had a package in my company’s mail room. When I went down I found this waiting for me. My heart stopped. Damaged?? Oh no. I thought the delay was a big Customs bill! But all was not as it seemed. I opened the plastic bag and retrieved the package from Goodwriters. It looked perfect; it was a sturdy paper cylinder with strong tape on both ends. It certainly did not appear damaged. I shook the cylinder and did not hear any loose parts rattling round. So I carefully opened one end and took out the double thickness bubble wrap that encased the pen. Inside the bubble wrap was the Waterman. In pristine condition. Cue the singing angels. No idea what Canada Post was going on about with their Apology bag. 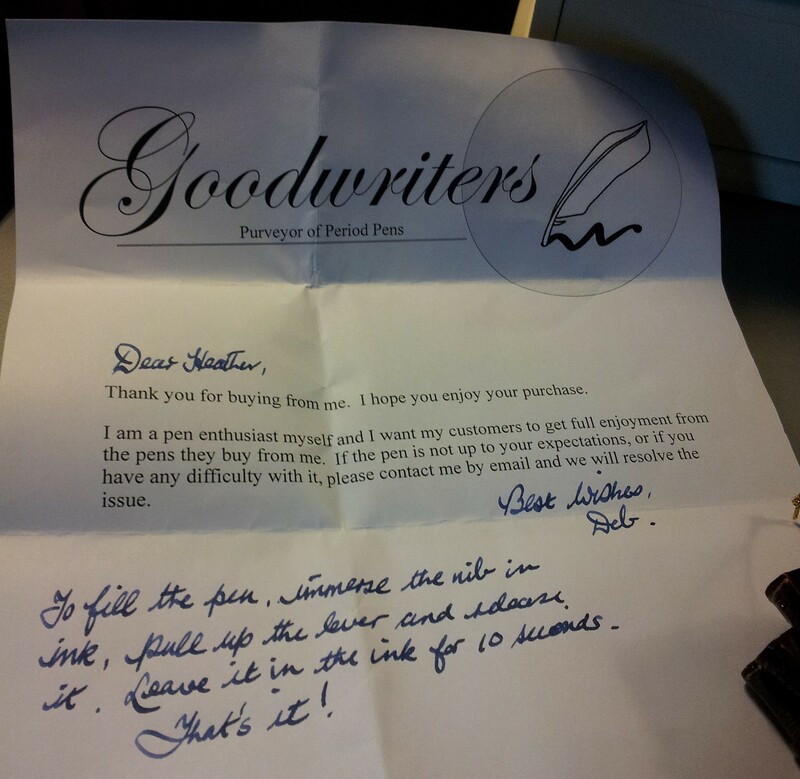 Deb, the wonderful woman behind Goodwriter’s, sent this lovely note, along with instructions for filling the pen. It is a lever filler, which I have never used before. I followed the steps she outlined, about three times, and the pen started writing immediately. Cue those angels again! Here she is in all her glory. I think it is in remarkably good condition for being around 80 years old! The body is smooth with no visible dents or nicks. The chrome is bright but not overly shiny, like a new pen would be. The lever lifts very smoothly and snaps back into place easily. It’s certainly a new experience, that lever filling system. It’s weird not being able to get into the “guts” of the pen. But it works and Deb told me it shouldn’t need servicing for at least 10 years. It’s impossible to tell how much ink is left but that’s ok. I now understand what the fuss about gold nibs is all about. The nib is smooth and I am so impressed with the writing. It is a smaller pen (just under 12 mm capped; just under 15 mm posted) and very light. The nib seems delicate and I know I have to get used to it; I feel like I might snap it off at any moment. It looks like a prop from an Agatha Christie movie, which is part of my delight with it. And here’s the reason it’s called a Canadian Waterman Junior. The Waterman company had a factory in Montreal roughly between 1905 and 1954. 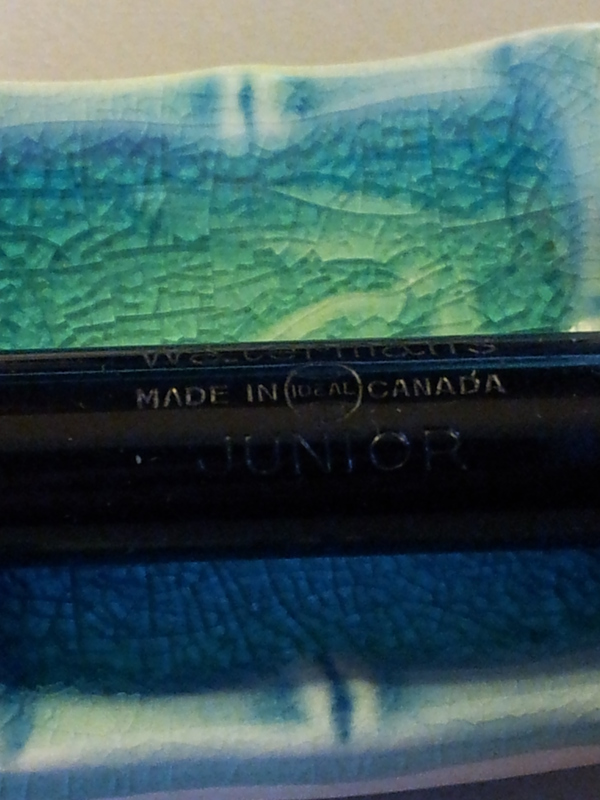 The nib says Made in the USA and both the barrel and cap say Made in Canada. Being a patriotic sort this really appealed to me. Here’s the Waterman next to some modern pens. 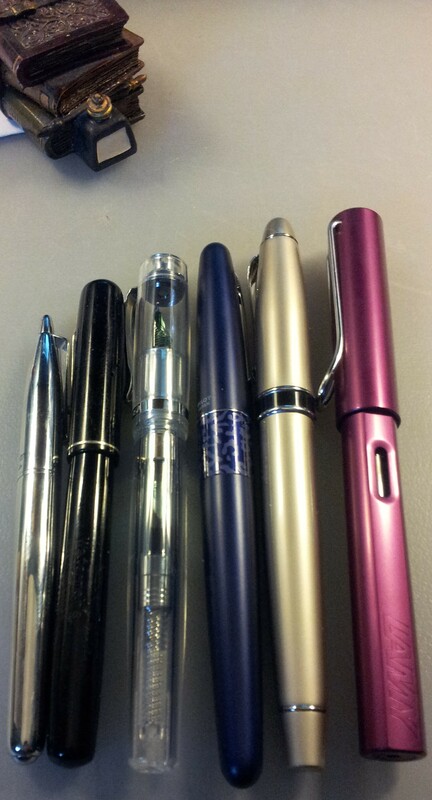 From left to right: Monteverde Paquito; Waterman Junior; Monteverde Artista Crystal; Pilot Metropolitan; Cadence; Lamy Al-Star. So let’s get to a writing sample. It is a beautiful writer, very smooth and constant. I inked it with Waterman’s Absolute Brown which I got for Christmas. The notebook is my Winnable Executive. So that’s my Canadian Waterman Junior. 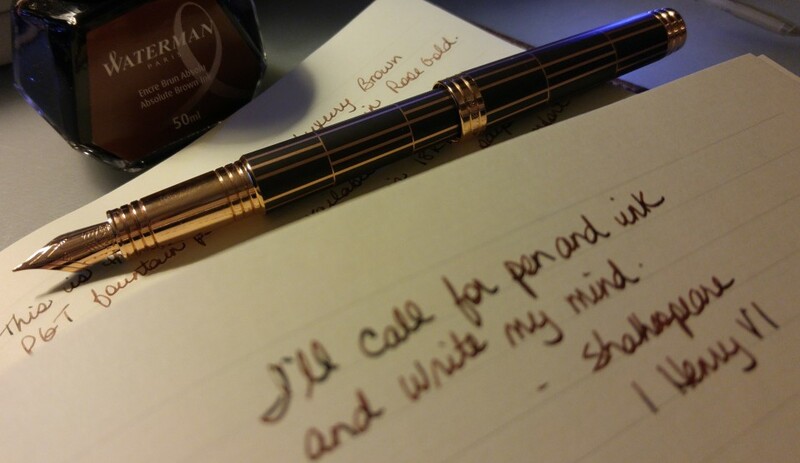 My first vintage pen, first gold nib. It probably won’t be my last.